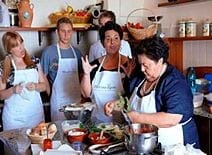 Mamma Agata's cooking course takes place in her private home situated high on a clifftop, 1000 feet above the sea level. 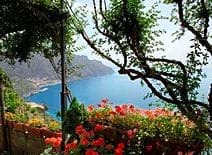 Mamma's Hidden Treasure is a very gracious home that majestically overlooks the Amalfi Coastline, with wonderful terraces and a spacious garden full of lemon trees, fruit trees, flowers, vegetables and poultry and she produces nearly all the food that she cooks for the school and the family!! "Mamma Agata" has been the chef for many major Hollywood actors and actresses, including Humphrey Bogart, Anita Eckberg, Richard Burton, Lyz Taylor, Fred Astaire, Charles Cubbon, Van Efflin, Federico Fellini (a big pasta e fagioli lover), Jaqueline Kennedy (1962 in Ravello), Marcello Mastroianni and also for important international journalists, writers and politicians such as Susanna Agnelli. Mamma Agata has a special gift for cooking and she will show you how to create wonderful pasta dishes, incorporating her own special recipes. Some of the ingredients she incoporates into her menus include veal, fish, chicken and seasonal vegetables, and additional recipes learned include pizza, cakes, traditional marmalade and preserves. If Mamma Agata is the soul of the family, Chiara is the heart. She is the lifeblood, maintaining the "heartbeat' of the household to ensure all parts work harmoniously. Through love and encouragement, Chiara constantly nourishes and provides support. 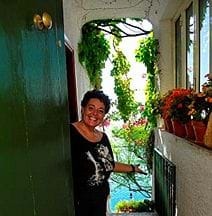 There is no doubt that Chiara is a "people" person who genuinely loves to share her knowledge and life with others and will lead you through the Cooking class and the experience at the Hidden Treasure. As a daughter, mother, wife and businesswoman, this is no mean feat and makes her a true "Hidden Treasure". When Gennaro was a boy of only 12 years, he started to show an intense desire to learn how to cook - a rare occurrence for a school boy his age. This really pleased his mother, who is a very strong and dynamic woman who worked in a stone cave by day, aand cared for Gennaro and his brother and his sister in the evening. Gennaro began helping his mother prepare their evening meals, as well as the big Sunday family dinner. His mother was very lucky and grateful to have help in the kitchen from her young son, as most boys his age would prefer to play soccer or hang out in the piazza with their friends - definitely not in the kitchen with their mother. There is a nice parallel between Gennaro's and Mamma Agata's story. They both share a huge passion for cooking from a very young age, and they both spent their years as young adults working in the culinary field and now of course, they share their passion for food and wine with the guests at the Hidden Treasure. 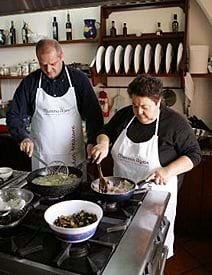 And in fact, Gennaro cooks side-by-side with Mamma Agata every day and each of them are such great cooks and although they have different techniques, they both reach the most amazing results - delicious food with wonderful flavours and Simple and Genuine cooking, of course! 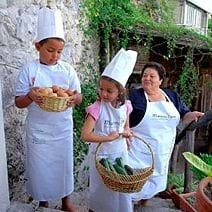 Gennaro is also a wonderful student of Mamma Agata and he is slowly learning all of Mamma Agata's many cooking secrets and one day soon, he will be the perfect cooking instructor too, carrying on the family tradition. 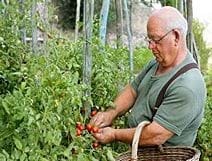 As his wife, I know in my heart that he will never stop studying and improving his skills because he endless energy and love for people, food and wine is a driving force and it will reinforce these inner passions and his love of teaching to all those who have the pleasure to meet him at our very special Hidden Treasure in Ravello. During your time with us, you will learn the secrets of traditional Italian Cuisine in a relaxing, friendly and warm atmosphere. Every day at the end of the lesson you will be able to taste the various recipes and enjoy some of the best local wine, while sitting on a breathtaking terrace overlooking the Mediterranean sea. 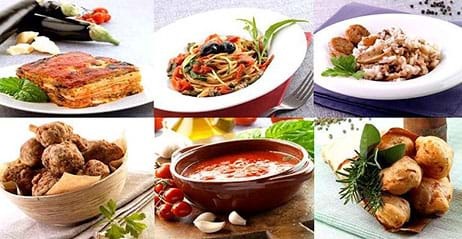 At the end of the course you will be able to cook wonderfull Italian meals for yourself, your family, friends and partners to organise Italian themed evenings or just follow a natural Mediterranean diet which is known to be one of the healthiest in the World.